The General Administration for Quality Supervision, Inspection and Quarantine (AQSIQ) is the administrative and law enforcement organ for quality control, measurement, inspection of import and export commodities, entry-exit health quarantine, entry-exit animal quarantine, certification and standardisation in China. It is the result of a merger between the State Bureau of Quality and Technical Supervision and the State Administration for Entry-Exit Inspection and Quarantine (CIQ) in April 2001. There are still quality and technical supervision departments and entry-exit inspection and quarantine departments in various provinces, autonomous regions and municipalities, but the entry-exit inspection and quarantine departments are directly under the administration of AQSIQ. Objects subject to entry-exit inspection and quarantine include commodities (including animal and plant products), and means of transportation and transport equipment carrying commodities, animals, plants and passengers in and out of China, as well as persons entering and exiting the country. The former CIQ published the Catalogue of Import-Export Commodities Subject to Inspection and Quarantine by Entry-Exit Inspection and Quarantine Organs, which was revised in January 2005. The catalogue is regularly updated based on the latest foreign trade situation, and covers the majority of commodities, means of transportation and transport equipment subject to mandatory inspection and quarantine. Commodities not listed in the catalogue but are found to have problems unexpectedly must undergo statutory inspection and quarantine within a specified time. Commodities for which inspection and quarantine are required in foreign trade contracts are also subject to mandatory inspection and quarantine. China adopted the practice of "quarantine inspection before customs declaration" in customs clearance following the establishment of a new clearance system for goods subject to inspection and quarantine on 1 January 2000. Import Goods Clearance Slips and Export Goods Clearance Slips stamped with the special seal of inspection and quarantine authorities are issued to goods subject to entry-exit inspection and quarantine upon satisfactory inspection. For import goods, inspection and quarantine authorities will issue an Import Goods Clearance Slip after receiving application for inspection. Customs will examine and release the goods upon presentation of the slip. Goods that pass inspection and quarantine will be issued an Import Goods Inspection and Quarantine Status Notice, while those that fail will be issued a quarantine inspection report for claiming compensation. For export goods, those that pass inspection and quarantine will be issued an Export Goods Clearance Slip to be used by customs as the basis for the verification and release of the goods. In cases where foreign importers require inspection and quarantine certificates, such certificates will be issued upon application by the foreign trade party and satisfactory inspection and quarantine. A non-conformity notice will be issued if the goods fail inspection. For import and export goods (including transit goods) listed in the catalogue, customs will examine and release the goods against the Import Goods Clearance Slip or Export Goods Clearance Slip issued by the entry-exit inspection and quarantine authorities at the place of declaration. Unless otherwise specified in AQSIQ documents, if an enterprise is required to provide inspection certificates on the quantity etc of import and export goods not listed in the catalogue, it may obtain such certificates from inspection organisations designated, recognised or approved by AQSIQ. Inspection and quarantine procedures normally include six steps: application for inspection, acceptance of application, calculation and collection of fees, inspection and quarantine, decontamination treatment, and issuance of certificate and release of goods. According to the latest amendment of China's Commodity Inspection Law, the appraisal procedures for import and export commodities include sampling, inspection and examination; appraisal, accreditation and certification; and registration, authentication and approval. China practises a system of pre-shipment inspection for wastes imported as raw materials. In contracts concluded between consignors and consignees on the import of wastes, it must be clearly stipulated that the wastes to be imported measure up to China's environmental protection standards and must be inspected and approved by AQSIQ or inspection organisations recognised by the state before shipment. Five categories of commodities are listed in the catalogue under this system. They include paper waste, metal waste, plastic waste, wood product waste and textile waste. Packaging for transporting export commodities that require inspection by AQSIQ in accordance with the catalogue or other laws and regulations must undergo performance tests by AQSIQ or its designated inspection organisations. Packaging not inspected or fail to pass inspection may not be used for containing export commodities. China practises a dangerous export goods quality licensing system for packaging for dangerous goods for export. Production enterprises must register with AQSIQ and apply for an export quality licence. Packaging for dangerous goods must undergo performance and usage tests before it can be produced and used. The Commodity Inspection Law stipulates that import and export commodities subject to mandatory inspection may be exempt from inspection upon approval of applications from consignors or consignees by commodity inspection departments. Offshore production enterprises applying for exemption of export commodities from inspection should have passed appraisal and been issued quality assurance certificates by organisations recognised by or have certification agreements with AQSIQ. Production enterprises for export commodities should have passed appraisal and been issued quality assurance certificates by the China National Accreditation Board (CNAB). Import and export commodities with safety, sanitary and other special requirements may not apply for exemption from inspection. AQSIQ conducts random checks on import and export commodities exempted from inspection; goods found with quality problems will not be released. The following must undergo animal and plant quarantine: animals and plants, animal and plant products and other quarantine objects for import, export or transit; containers, packages and dunnage used for carrying animals and plants, animal and plant products and other quarantine objects; means of transportation from epidemic areas; old and disused vessels entering the country for salvage purposes; and other goods or articles subject to quarantine in accordance with the provisions of relevant laws, administrative regulations, international treaties or trade contracts. The following are prohibited from entering China: pathogenic micro-organisms (including seed cultures of bacteria and viruses) of animals and plants, pests and other harmful organisms; related animals and plants, animal and plant products and other quarantine objects from countries or regions with outbreak of animal or plant epidemic; animal carcasses; and soil. 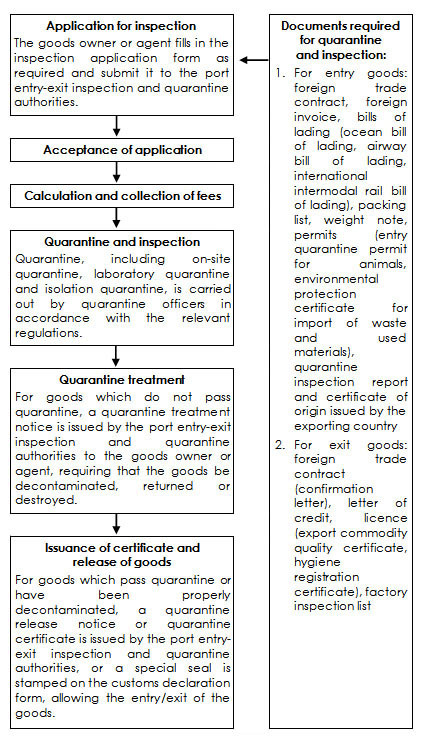 An entry quarantine licensing system is adopted whereby the consignee is required to make an application in advance for the import of animals, animal products, seeds, seedlings and other propagating materials, and complete the quarantine approval application formalities before concluding the trade contract. Application should be submitted to the local inspection and quarantine authorities at the port of entry upon arrival of the goods. Goods that fail to pass quarantine or require further quarantine measures will be returned, destroyed or decontaminated by the inspection and quarantine authorities. Animals and plants, animal and plant products or other quarantine objects for export are subject to quarantine supervision in their production, processing and storage. Applicants should apply to the inspection and quarantine authorities at the port of exit for quarantine prior to the export of goods. Objects failing to pass quarantine will not be allowed to leave the country. For the transit of animals and plants, animal and plant products and other quarantine objects (including transshipment), application should be made to the inspection and quarantine authorities for quarantine. For the transit of animals, it is necessary to obtain an Animal Transmit Licence in advance. Animals and plants, animal and plant products and other quarantine objects carried or posted into China will be returned or destroyed if they are included in the List of Animals and Plants, Animal and Plant Products and Other Quarantine Objects Prohibited from Being Carried or Posted into China. Those not covered by the list will be released after quarantine. The inspection and quarantine authorities will carry out on-the-spot quarantine for means of transportation from epidemic areas. Vehicles carrying animals out of the country must be disinfected under the supervision of the inspection and quarantine authorities before loading. Vehicles carrying animals and plants, animal and plant products and other quarantine objects must conform to the relevant epidemic prevention and quarantine regulations. For empty vehicles returning after carrying animal supplies to Hong Kong and Macau, the inspection and quarantine authorities require that the entire vehicle has to be disinfected for epidemic prevention. Entry-exit inspection and quarantine authorities are responsible for conducting medical and sanitary examinations on persons, means of transportation, containers, biomaterials and dead bodies (human bones) as well as luggage, goods, postal parcels which may spread epidemic infectious diseases entering or leaving China. Means of transportation and persons entering the country are subject to quarantine at their first port of arrival, and those leaving the country at the last port of departure. Inspection and quarantine authorities will issue an entry or exit quarantine certificate to persons not found with infectious diseases or to vehicles that have already undergone sanitation treatment. Inspection and quarantine authorities may require persons on arrival or departure to complete health declaration card and present vaccination/ inoculation certificate, health certificate or other relevant documents. They may also isolate and detain for examination persons on entry or exit found to have contracted plague, cholera and yellow fever, and deny entry to foreigners with AIDS, venereal diseases, leprosy, mental illnesses or open tuberculosis. Persons found to have epidemic infectious diseases may be detained for examination or issued medical treatment cards. Entry-exit ports and means of transportation staying at these ports are subject to sanitary supervision by inspection and quarantine authorities. The authorities are responsible for supervising and giving instructions on the prevention and extermination of germ-carrying rodents and insects; inspecting and testing food, drinking water and facilities for their storage, supply and transport; monitoring the health conditions of employees engaged in the supply of food and drinking water; monitoring and checking the disposal of garbage, waste matter, sewage, excrement and ballast water; and taking the necessary measures where sanitary conditions are poor or factors exist that may cause the spread of infectious diseases. Inspection and quarantine authorities will conduct sanitary treatment such as sterilisation and extermination of rats and insects on vehicles, containers, luggage and postal parcels entering from or leaving for epidemic areas, contaminated by infectious diseases, or found with infectious diseases media. China implemented its new system of compulsory product certification since 1 May 2002. Under the new system, a unified catalogue, standard, mark and fee schedule are in place and the CCC (China Compulsory Certification) mark has replaced the Great Wall CCEE and CCIB marks used in the old system. The old product safety certification system and import safety and quality licensing system were annulled on 1 May 2003. The CCC mark is the certification mark for products which are allowed to be imported, sold or used in China. According to the Regulations for the Administration of Compulsory Product Certification, the new system came into effect on 1 May 2002. In order to ensure a smooth transition to the new system and protect the legitimate rights of all parties concerned, the old system was phased out on 1 May 2003. Starting from 1 March 2006, children's vehicles, battery-operated toys, plastic toys, metal toys, projectile toys and dolls are subject to compulsory product certification. From 1 June 2007 onwards, any of these six types of products which have not been certified or do not carry the certification mark will not be allowed to leave factory, be sold, imported or used in sales activities. With the exception of objects requiring inspection and quarantine by inspection and quarantine authorities under the provisions of existing laws and administrative rules, foreign trade parties, foreign organisations as well as law enforcement, judicial and arbitration departments may entrust or designate AQSIQ to conduct inspection, quarantine or appraisal of goods, animals and plants and their packaging, transport vehicles and shipping technical conditions, and to issue the relevant certificates as valid documents for the handover of import and export goods, calculation of charges, customs clearance, computation and payment of duties, claims for compensation, and arbitration. CIQ is the official organ for the issuance of general certificates of origin. It is also the only organ authorised by the Chinese government to issue GSP (Generalised System of Preference) certificates of origin. Export enterprises may apply to local entry-exit inspection and quarantine authorities for general and GSP certificates of origin. Import and export commodities related to processing with supplied materials and assembly with supplied parts and components are inspected by their owner or the processing enterprise. In case of dispute, application for appraisal may be made to commodity inspection organs. For production with supplied samples and drawings, if the raw materials, parts and components are supplied by the foreign party, the same procedures for processing with supplied materials will apply. If the foreign party only supplies the samples and drawings, and the raw materials, parts and components are the responsibility of the Chinese party, the requirements of commodity inspection organs for the inspection of general import and export commodities will apply. In other words, commodities included in the catalogue must be reported to commodity inspection organs for inspection and will be inspected and issued inspection certificates by the inspection authorities. Commodities not included in the catalogue may be exported after passing inspection by the enterprises themselves. In case of disputes between the supplier of samples and drawings and the production and processing party, application for appraisal may be made to commodity inspection organs. (b) Procedures for Inspection of Commodities Produced or Processed with Supplied Materials or Assembled with Supplied Parts and Components by Foreign-Invested Enterprises for Domestic Sale Commodity inspection organs will regard as imports goods produced or processed with supplied materials or assembled with supplied parts and components by foreign-invested enterprises (including wholly foreign-owned enterprises, Sino-foreign equity joint ventures and Sino-foreign contractual joint ventures) for sale within the Chinese territory (except Hong Kong, Macau and Taiwan). Such goods have to be registered at commodity inspection organs before their sale. Re-registration is necessary if there are changes in their specifications, raw materials used, product quality and constituents after registration. Domestic sale products included in the catalogue that involve safety or hygiene must be reported to commodity inspection organs or relevant departments for inspection and can only be sold after passing the examination and being issued a certificate. If necessary, commodity inspection organs may conduct spot checks of these commodities at the plants or in the market at any time. Products that are inferior in quality, inadequate in weight and quantity, poorly packaged or not meeting inspection requirements will be issued the "Prohibition from Sale Notice" and banned from sale in China.